1 Who's In Charge? Who Benefits? The Marion Zimmer Bradley Literary Works Trust holds Marion Zimmer Bradley's copyrights and administers the anthologies she edited. It appears that the "Marion Zimmer Bradley's Living Trust" (cited as the publisher of Marion Zimmer Bradley's Fantasy Magazine from 1994-2000) is the same organization/corporation. In 2012, the Trust was the complainant regarding two Darkover pieces of fan fiction called The Women of Darkover and Molly of Darkover. See: Marion Zimmer Bradley Literary Works Trust and Unauthorized Fanworks. Who's In Charge? Who Benefits? Sorting out who does what and who benefits is tricky. 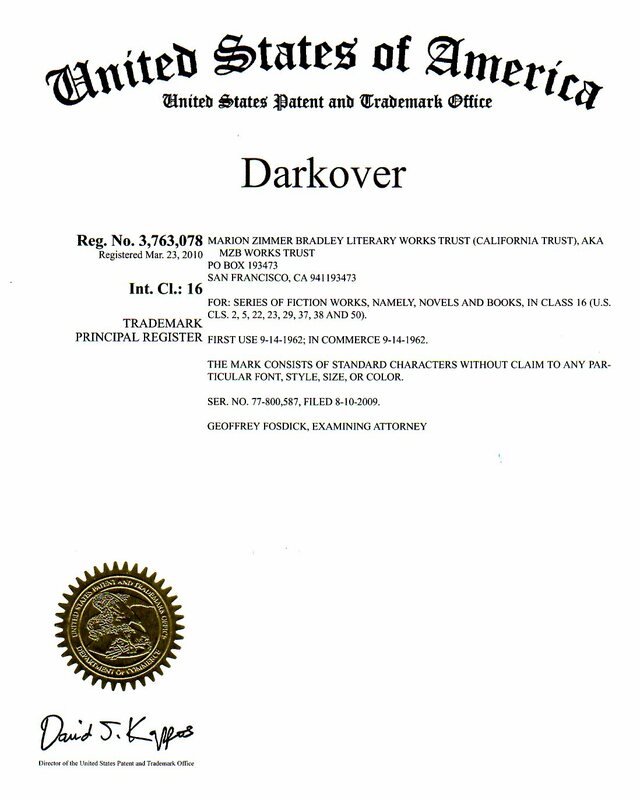 The Marion Zimmer Bradley Literary Works Trust registered the trademark for Darkover on March 23, 2010. Darkover® is the property of Marion Zimmer Bradley and her heirs, and the right to prepare a derivative work belongs to the copyright holder. This means that even if you don't publish it or make money from it; it's still illegal. Nobody is allowed to write a Darkover® story or novel without a contract with the Marion Zimmer Bradley Literary Works Trust. You may not write a Darkover® story in English, French, German, Italian, Portuguese, or any other language. Any legitimate editor you sent it to would not publish it because that would be a violation of copyright laws and the Berne Convention. If you have an idea for a Darkover® story, create a new background -- a new universe -- rename your characters, and write it so that the story is clearly NOT Darkovan. Two excerpts from an interview with her Trust, see Author Interview: Marion Zimmer Bradley Trust: Ann Sharp and Lisa Waters. What pushed Marion Zimmer Bradley to become a working fiction writer? Why did she go down that creative path? A.) MZB used to say that she didn’t want her children raised by someone whose market value was less than hers, and writing enabled her to work at home. She really wanted to become an opera singer, but she didn’t have the resources to train  ; writing was her second choice. MZB became a formidable editor, launching a fiction magazine and a successful series of anthologies based on her Darkover world. Why did she decide to become an editor? Did financial need drive her, or did she see it as a way to pay forward? Was she trying to channel fan fiction into building new writers? Delegation is a good thing, but there are some things a writer can't delegate, such as writing her books. Things that can be delegated include website design and updating, social media, newsletters, answering fan mail (or e-mail), etc. There are certainly parts of producing an anthology that can be delegated--I know this because Marion delegated everything she didn't want to do to me: sending contracts; paying advances; sending contributors' copies; keeping track of royalties, authors' changes of address and names; and paying royalties. Her death added choosing the stories and the final line-up, assembling the manuscript and sending it to the publisher. Vera's/Norilana's bankruptcy added producing the book to the job. At least the Trust is willing to pay to have someone else do the book covers, because I'm horrible at that. Then there's all my work for the Trust. At the moment, we have 20 anthologies in print, with two more coming this year, and two more planned for 2015. Most of them are paying royalties, and I expect the ones that aren't yet to do so in the next year or two. Given the number of authors involved, paying royalties is becoming a big job. When Marion was alive, she had a staff of four people in her office, plus another two in her household. Since her death, we've lost that staff to death, jobs that provide the salary needed to live, other interests, other responsibilities, and the fact that all of us are getting older. Only two of the staff were younger than I, and one of them is the one who died. So I'm the next-to-youngest, and I'm eligible to collect Social Security this year. The MZB Literary Works Trust has starting publishing eBooks on Kobo (I attended their presentation at the RWA Conference in NYC last summer). The most recent book is the anthology I edited last year: Sword and Sorceress 30. ↑ Delegation; WebCite, April 30, 2014, posted right before the allegations against Bradley were publicized.